7 What else is in the box? This OXP adds some local missions to the Bulletin Board System, to hopefully add more things to do in and around each system. Very little by way of new ships, stations, equipment or AI's has been added to the game. The idea was to simply make use of the existing assets in new and (hopefully) interesting ways. There are a number of different missions available, and the availability of these missions depends on a number of factors (score, system tech level, government type, installed equipment etc). Missions can be offered in a number of ways: via the Bulletin Board, from scooped escape pods, from passing ships, or from emails. This OXP also includes the concept of "mission chains", in that completing one mission may trigger a second mission, which could then trigger a third mission, and so on. Sometimes the player is given an option as to whether they want to perform the secondary mission, and sometimes they won't be. Generally, all the missions are optional. If you don't visit the Bulletin board, you won't see what's on offer, and very little in the game will change if you don't do the missions. You may occasionally be offered a mission when scooping escape capsules, and sometimes passing ships will pass on requests. Also, one of the coded events that can occur in your current chart will make particular systems difficult to enter for a period of time. Notes about missions: Some of the missions in this pack can impact on other areas of the game. For instance, one type of mission, if completed successfully, will result in a higher frequency of mis-jumps to a particular system. Some missions can effect the commodities of a station, or the availability of equipment at a station. It will hopefully be obvious when these changes take place (ie as a result of completing a mission). This mission pack contains over 60 different missions and variations, but most of the missions fall into one of these general categories. Hunter - Hunt down and destroy certain ships (asteroids, pirates, traders, Thargoids, police, etc). Recovery - Find and collect certain items (cargo, derelicts, black boxes, data packets, etc). Rescue - Locate and collect escape pods, deliver critical equipment to stricken ships, deliver medical supplies. Delivery - Take cargo between one point and another, but outside the normal cargo mission system. Covert - Install spying software, disrupt station economies, hack witchpoint beacons. Donation - Donate money or cargo to charities to gain economic or legal advantages. Fuel/Cargo scoops and the Advanced Space Compass are required for many of the missions. If your ship lacks these items, certain missions will be unavailable. Broadcast Comms MFD is a requirement for many of the missions, as it provides an interface for ship-to-ship communications. If you have not purchased this item, some of the missions will be unavailable. Some new equipment has been added with this OXP. When this item is purchased, installed and primed, you can press the "b" key (Mode) to switch the mode between escape capsules, black boxes, asteroids, ships, communication relays and cargo pods. Pressing the "n" (Activate) key will initiate a scan of the local area, up to a distance of 200km. The scan will take approximately 2 seconds to run, but will be run continuously until deactivated with the "n" key again. Any objects of the selected type within range will be displayed, along with the distance to the object. A "+" or "-" indicator will be displayed next to each item, showing whether you are moving away from, or towards, the target. Beyond this, the range finder does not provide directional information. The information returned by the scan is displayed in an MFD, so you will need to select an MFD slot (using the ":" key) and then select the Range Finder MFD (using the ";" key). Note: When the Range Finder is activated, there will be a drain on your ships energy. If the Ship Configuration OXP is installed, engaging the Range Finder will also generate cabin heat. An additional device, a Range Finder Extender, can increase the range of the scanner to 500km. This device will be issued to the player when attempting particular missions, although it can also be purchased independently from TL3 systems for 60cr. It is a primable piece of equipment that will communicate with any communication relays in the system and request the beacon to be switched on for a short period of time. The device can be used 3 times before needing to be recharged. Using the device will incur a 5% penalty on whatever mission the communication relay relates to. This item will replace all the degraded parts of the switch, allowing it to be used 3 more times. The cost will vary, based on how degraded the current parts are. It is available in all systems. This device makes use of the tractor beam which forms part of the cargo scoops. When your ship is aimed at cargo cannisters that are floating away and this device is activated, it will use the tractor beam to bring the cargo to a stop. Cargo must be within 2km of your ship, and in the centre area of your front viewscreen, otherwise the tractor beam can't reach it. This device attaches to the end of the cargo scoop, and when engaged, will apply some force to any ejected item so that it will slow to a stop within a short period of time, rather than floating away at a constant rate. Once purchased, the unit must be turned on before any cargo will be impacted. Prime the "Ejection Damper" equipment, and press either the "Mode" (b) or "Activate" (n) key to turn the unit on. Pressing those keys a second time will turn the unit off. The unit is automatically turned off whenever your ship docks. When the unit is on, all cargo ejected will be slowed to a stop. The device can be used on 50 ejected items before it needs to be replaced. Bulletin Board System - Required as all missions are accessed through this interface. BroadcastComms MFD - Required for missions that need ship-to-ship communications to take place. Also used for accepting or declining secondary missions. Email System - Provides another interface for missions to be offered. The following OXP's are listed as recommended, in that additional text and/or gameplay options will become available if they are installed. Snoopers or GNN - Some news items will be published periodically, which can add some flavour to game events. Manifest Scanner - Can aid with finding cargo in other ships, which can be very important if you are on a mission to steal certain cargo. Cargo Scanner - Can help with some missions to identify the contents of cargo containers. Smugglers - The Galactic Underworld - Some additional opportunities are available through the Black Market interface in this OXP. Satellites OXP - Some missions are available related to the various satellites created by this OXP. Reputations: The missions available to the player originate from a number of different entities - governments, corporations, factions of every stripe. As missions are performed for these entities your reputation will increase. However, given the number of entities involved, a new F4 interface screen has been created that combines all reputation information into an easy to read display. Also, any awards received can be displayed as well. If you have the Library OXP installed, you additionally have the option of importing a variety of internal and OXP reputations into the screen, rather than having those reputations displayed on the F5F5 Manifest screen. Download GalCopMissions.oxz v0.5.3 (downloaded 746 times). Thanks to Svengali and Disembodied for their PhraseGen tool. Thanks to Ramirez for his remote mine model (from the "Missiles and Bombs" OXP). Thanks to these forum members who have submitted bug reports or suggestions that have helped make the OXP better: Nite Owl, herodotus, Astrobe, Damocles Edge, Cody, Bogatyr, pagroove, gsagostinho, Cmd. Northgate, Balisongdalo, javirodriguez, and lohcek.gsagostinho, Cmd. Northgate, Balisongdalo, javirodriguez, and lohcek. Special thanks to cim who has very kindly given permission to include his "Black Box" model from Rescue Stations in this OXP. The number of asteroids required to complete the Asteroid Removal missions (type 1) is now restricted to be less than the number of asteroids currently in the system. Fixed bug in the Hit Teams script where the definition of the "$initiateInvestigation" routine was inaccurately declared. Fixed invalid variable reference error. An email will now be sent to the player when they accept their first mission to Interstellar space, offering tips on how to enter interstellar space, and what to expect when they get there. Added "Cargo pod" mode to Range Finder. Changing the Range Finder mode will now clear the MFD of previous scan results. Fixed bug with missing variable declaration in failed mission function call. Removed debug flag that would cause a particular mission to always be generated. Fixed issue with secondary mission after investigation mission (132) not having correct destination on manifest. Fixed title in manifest.plist file. Fixed missing reference error when completing data cache missions. Fixed missing reference error when completing black box missions. Fixed missing reference error when completing meet ship missions. Fixed missing reference error when completing hacking/restoring witchpoint beacon missions. Fixed missing reference error when completing some solar activity missions. Fixed missing reference error when completing some disease outbreak missions. Added some fallback code in case cargo pods are not spawned with our preferred barrel type. Fixed incorrect worldScript name references in Pirate Bases script. Added extra qualification to mission destination texts that refer to main planet, to help distinguish the main planet from any additional planets. Tweaked one investigation mission to limit its availability to more experienced players with an upgraded ship. Fixed issue with the Thargoid wreckage mission (13) which wasn't recognising wreckage collected in interstellar space. Fixed spawning issues for investigation missions (types 130-139). Tweaked the power of the proximity mine. Added investigation missions (types 130-139). Switched from using a dummy alloy ship entity as a navigational beacon to using a visual effect. Code refactoring, improving code reuse. Split more mission specific functions out of general script file to associated script file. Fixed issue with some missions having a decimal amount as part of the payment. Performance improvements when generating new missions for a system. Fixed status message with drug dealer mission (15). Linked the MFD to Broadcast Comms MFD in the Auto-Prime Equipment OXP. Makes use of GNN OXP if installed. Improved handling of player ship death scenarios. Fixed linkage to Home System. Added the Ejection Damper equipment. Reduced the effective range of the Cargo Stopper to approximately 2km to make it slightly less OP. Added a sound effect for the tractor beam when activated. Tweaks to the positioning of ships for "Special Delivery" missions (40/41). Fixed issue with "Special Delivery" mission (40), where the target ship was not responding to the "I don't have any more" comms message. Tweaks to the scavenger AI, so the target ship doesn't jump out of the system prematurely. Added Advanced Space Compass as a requirement for "Special Delivery" missions (40). Fixed issue with escape pod rescue missions (21, 22, 25) not being completable. Moved more interstellar populator routines into the correct methods. Removed some hard-coded scanner range values. Fixed issues with the "Collect cargo" (6/7) missions, where scooped cargo was being counted as destroyed instead of collected. Fixed issue with "Special Delivery" (40) missions where, if cargo was dumped and then re-scooped because it was drifting out of range, when the cargo was re-dumped the target ship was ignoring it. Fixed issues with missions that have multiple stages (types 41, 63, 64, 65, and 73) that weren't being initialised correctly and so would never start. Fixed issues with escape pod rescue missions (20) and runaway escape pod missions (25) that was preventing the escape pods from being spawned. Added a new device, a Comms Relay Beacon Switch, that is issued to the player for any "Collect data cache" (31) or "Special delivery" (41) mission. This device will turn on the comms relay beacon again after the initial transmission period has expired, although using it will incur a 5% payment reduction. Added a new device, the "Cargo Stopper", primable equipment available from TL6 systems, which, when pointed at moving cargo and then activated, will bring the cargo to a stop. Fixed issue where I.T.H.A. reputation was not being removed from the F5 page correctly when reputations were set to be moved to the "Reputations and Awards" page. Forced bonus payment calculations to return an integer, rather than a decimal. Adjustments to the population routines for interstellar space. Fixed bug where reputation was not being applied correctly for missions where multiple reputation entities were defined. Fixed bug with distance calculation in the Disease Outbreak script. Adjusted time calculation for travel between threatened satellites during a satellite defend mission. Added reputation links to Home System OXP. Better handling of Combat Simulator. Adjusted calculation of the number of deaths from a disease outbreak. Fixes to secondary missions sourced from black boxes or escape pods or passing ships having a termination penalty. Fixed bug with Thargoid wreckage mission that was preventing the wreckage from being recognised. Made the "Collect Thargoid wreckage" mission have no expiry, and provided a means by which you can hand over incomplete amounts and continue. Removed debug flag from "Interstellar escape pod rescue" missions, so they shouldn't appear as frequently. Added some missions using Satellites OXP (types 110, 111, 113, 115, 122, 124). Fixed issue where emailed missions, or missions delivered via another ship, were not checking all the conditions, giving the player a mission they couldn't complete. Fixed issue with "Request for meeting" missions, where the target would not respond when the passcode was transmitted. Added additional text to mission briefing for missions that require an interstellar space destination to make it clearer this is required. 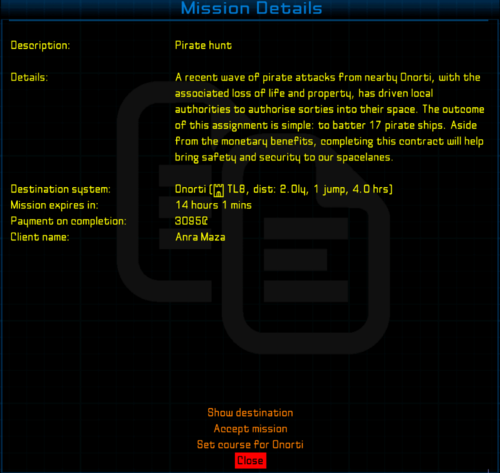 Added additional text to mission briefing to make it clearer when a mission requires the player to return to the source system in order to complete it. Applied distance and player score bonuses to Special delivery missions (type 40). Fixed issue with the WBSA device not being startable when the beacon is targeted. Fixed issue with the Range Finder not creating an energy drain. Added "Gather ingredients" mission (type 53). Fixed issue where missions with a deposit could have a negative net payment if the player's reputation is low. Fixed issue with manifest entries not reflecting the state of progress correctly. Reworked how textures are specified in mission definitions. Added overlay images to charity missions. Added routines to control the creation of asteroid fields, so they will be created in the same place in each system, and reused for future missions. Fixed issues with mission descriptions missing some text elements. Fixed issue with cargo recovery mission text containing ">undefined". Headings on the reputations page will now be suppressed if there are no related items to display. Converted text for mission types 74, 100, 101 and 102 to use the PhraseGen tool. Some tweaks/fixes to mission text. Better logic for determining what is a witchpoint buoy. Better client name generation using PhraseGen tool. Fixed minor text issue with the "decline mission" for escape pod messages. No mission accept/complete confirmation emails will be sent for secondary missions when the source of the mission is an NPC from an escape pod or a ship. If player ejects escape pod while in pod occupant is communicating, conversation will stop and mission offering will be correctly terminated. Improved robustness of "Rescue Stricken Ship" missions. Fixed issue where stricken ships were not communicating with player correctly. Fixed error when firing on the stricken ship after it was repaired. Better logic for determining if a pirate ship has just been destroyed. Added a "+/-" indicator on the Range Finder MFD, to make it clearer in which direction the player is moving in relation to the target. Prevented Cargo Shepherd magnets from being targeted by delivery ships. Corrected issues with intergrating to the Smugglers Black Market script. Fixed issue with escape pod missions not being complete-able. Turned off lights on derelict ships. Code refactoring to reduce the chance of scripts for various mission types conflicting with another. More robust logic for connecting with Smugglers Black Market. Made compatible with Oolite v1.84. This page was last edited on 13 April 2019, at 05:12.